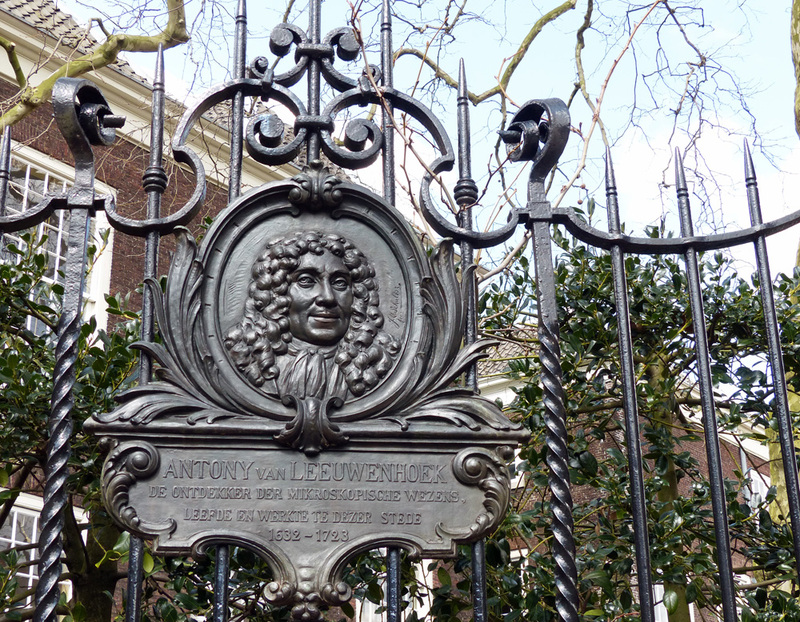 Here is part 2 in the “Walking in the footsteps of van Leeuwenhoek” story from Keith Seifert. Part 1 is here. as quoted by K. Todd, 2007, Chrysalis. If you would like to see the van Leeuwenhoek sights of Delft, you can easily follow this path in 2-3 hours, spending only a few euros on the way. Try to start early, at 10 AM or so, to avoid the Vermeer crowds, and remember that there will be services in the churches on Sundays. The suggested route is in chronological order, resulting in a reasonably coherent path. I have not provided a map here, but you can download this kml file and open it in Google Earth or other mapping program on your mobile. If you want to visit the Botanical Garden, not directly relevant to our protagonist, it would make sense to do this first. There you can see an attractive sculpture of dividing yeast cells, perhaps honouring one of the other famous microbiological institutions of this city, the biotech monolith Gist Brocades. – From the front of the train station, you can see the steeples of the two famous churches in the old town. Walk past the bicycle stands, cross the canal and Westvest road, and enter the old town on the narrow Barbarasteeg. Cross the Oude Delft canal, continue in the same direction and walk down Breestraat, then slant slightly right and walk down Gasthuislaan towards the Oostport gate. 1. 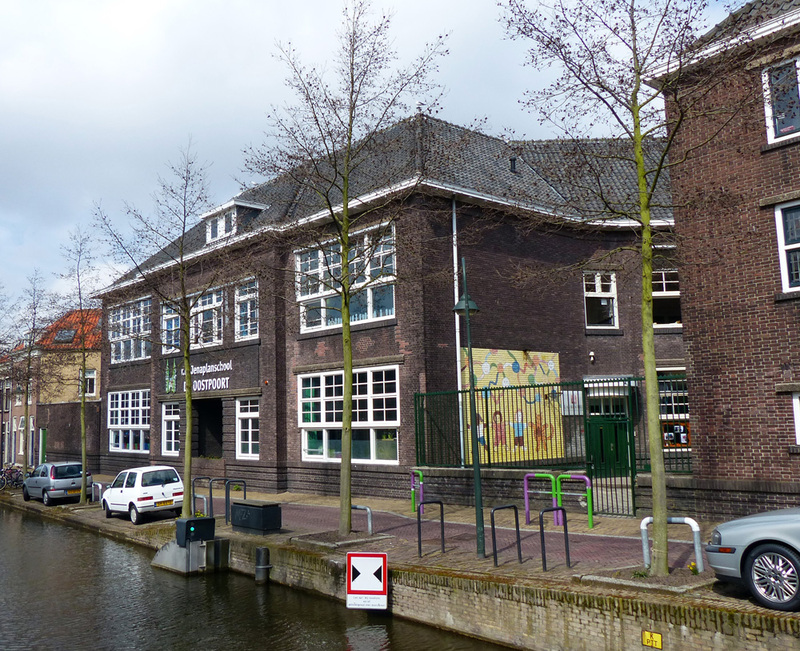 Van Leeuwenhoek’s birthplace (beside R.K. Jenasplanschool de Oostpoort, Oosteinde 6). Near the pretty Oostpoort (East Gate) of the town is this girls’ school. Van Leeuwenhoek was born on 24 October 1632 in a house that stood in what is now the playground of the school, beside the mural in the picture. A photo of the house can be seen in Dobell (1958); the building was torn down sometime after 1926. The notion that he was born in a house next to a contemporary girls’ school caused some civic confusion when it came to erecting the plaque at site 6. 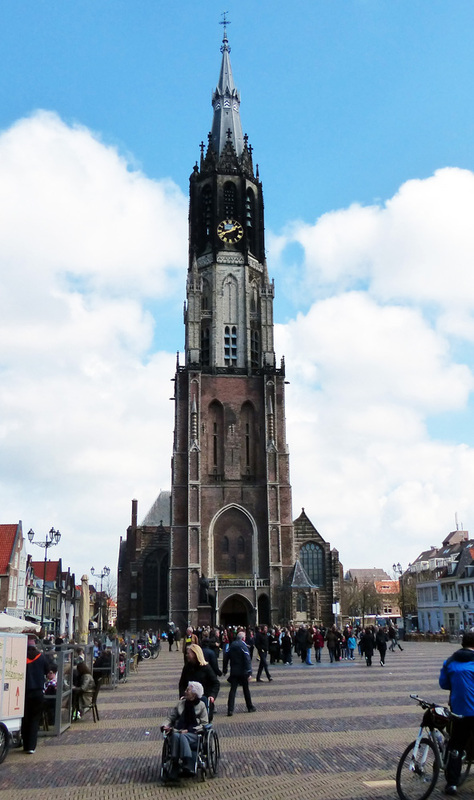 – Walk along the street Oosteinde towards the steeple of the Nieuwe Kerk. 2. Nieuwe Kerk (the New Church, Markt). 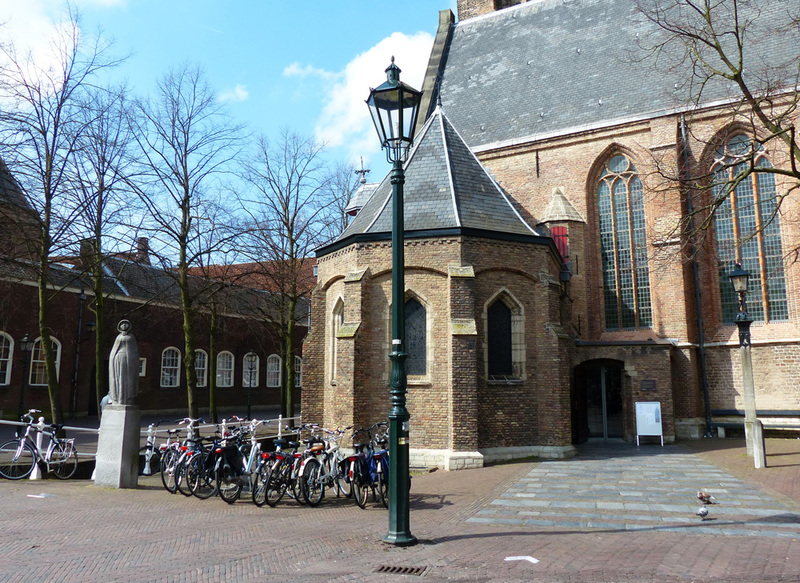 The entrance fee, in April 2013, was euro â‚¬ 3.20, and also allows entrance to the Oudekerk (site 5). Van Leeuwenhoek was baptized here on 4 November 1632. There is a baptismal font in the centre of the church; one would have to engage in some serious archival research to determine if this was representative of what was there 380 years ago. He was also married in this church to his first wife Barbara de Meij on 29 July 1654; she died on 11 July 1666 and was buried in the Oudekerk (site 5). The widowed van Leeuwenhoek remarried, but the venue for the second marriage was not mentioned by Dobell. – Walk across the town square to the Town Hall. 3. 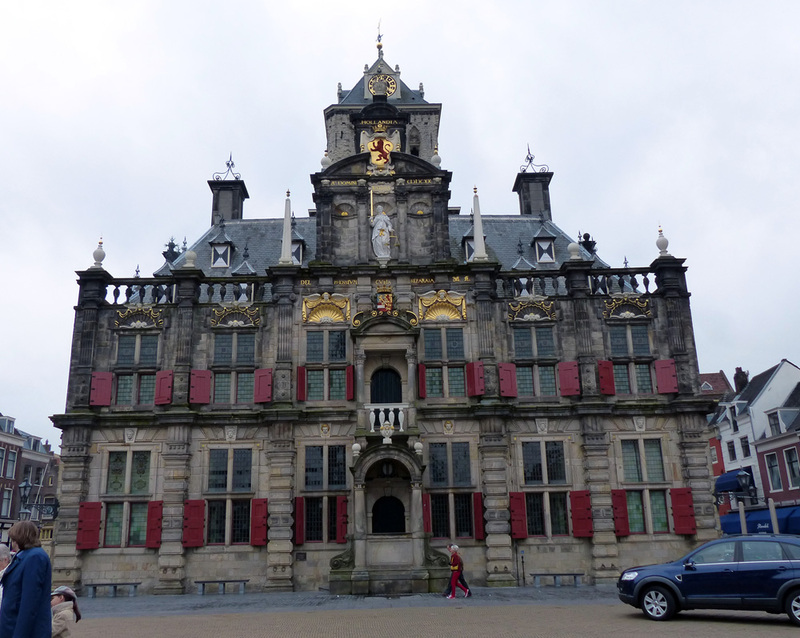 Stedhuis (Town Hall, Markt). On 26 March 1660, van Leeuwenhoek was appointed Chamberlain of the Council-Chamber of the Worshipful Sheriffs of Delft. Facing the building with the church at your back, his office was on the right hand side of the building on the second floor. – Walk around the right hand side of the Town Hall and cross the canal to the corner of Nieuwestraat and Hipppolytusbuurt, and walk down to the plaque on the wall of the clothing store. – Continue along Hipppolytusbuurt and turn left on Heilige Geestkerkhof to get to the Oude Kerk. 5. Oude Kerk (Old Church, Heilige Geestkerkhof 25). Enter the church in the inconspicuous side door by the statue of the saint Geertruyt van Oosten, through the gift shop. Show your ticket from the Neiuwe Kerk to the cashier. Van Leeuwenhoek was buried in the Oude Kerk five days after his death. His monument, erected by his daughter in 1739, is in the back of the church and is illustrated in the first part of this blog post. After you enter the church, turn left, then left again in the final aisle. His actual grave is beneath the two engraved stones in the floor in front of the crypt. – Return along the canal Oude Delft, on the side nearest the Market, past the Niewestraat, until you get to Boterbrug. 6. The Wrong Plaque (corner of Boterbrug and Oude Delft). Dobell pokes some fun at the municipal officials who erected this tribute to van Leeuwenhoek in the wrong place. The evidence suggested that his birth house was beside a girls’ school (see site 1), but they chose the wrong school. You can see that the text of the dedication was changed, with the last word altered to ‘stede’ (in this city), presumably from ‘plaats’ (in this place). Note: On the other side of the canal is a brightly decorated building, the headquarters of the Dutch East Indies Company, a major international corporation of the imperial Dutch Golden Age. There are apparently other van Leeuwenhoek mementoes to search out in Delft, in the depths of museums, such as the medal awarded to van Leeuwenhoek by the University of Louvain in 1716 (see the epigraph of Part 1 of this essay), but to see these you will have to do more digging than I could manage. For microscopes, you have to visit the Boerhaave Museum in Leiden. I will try to do that next year, to complete the Dutch leg of my van Leeuwenhoek odyssey.